"We have been working with Kathleen Zeren for over 20 years and have never considered using anyone else for our landscape needs. Kathleen has provided us with good service at a reasonable price and with a timely turnaround. We would recommend Kathleen to anyone who has a need for landscape services." Land Design and Development, Inc.
Kathleen has been on the Development Team for Port Warwick, a new residential community located in Newport News, Virginia since project inception. Port Warwick is a unique, high quality “mixed urban” neighborhood with the feel of an older, established area. At the heart of Port Warwick lies a three-acre public square and four secluded residential squares. The use of public art throughout the neighborhood creates an artful ambiance. Port Warwick has received numerous design awards. Kathleen has received two awards for her work there. 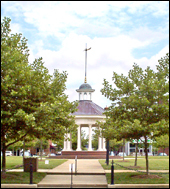 Developed street tree master plan and provided administrative services during installation. Landscape plan preparation for Styron, Emily Dickinson, Mark Twain, William Faulkner, and Scott Fitzgerald Squares. Preparation of all landscape regulations for project, including: Planting Requirements, Installation Specifications, and Plant Lists. Landscape plan preparation for all commercial sites. 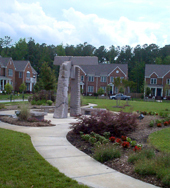 Performed landscape installation inspections for all commercial properties. Provided guidelines and review for residential properties. Landscape plan preparation for entryway, multiple sculpture sites, pump station site, and various residual areas. "I probably do not spend enough time thanking you for all of the good and hard work that you have done on the development. Without your work, Port Warwick would not be what it is today." Kathleen Zeren Landscape Design (KZLD) has been producing diverse, beautiful, and practical landscape design work since 1993 and Kathleen was busy designing for other concerns well before that. Twenty-four years of design experience has produced a remarkable volume of impressive work and a number of awards. From prestigious residential properties, country clubs, and commercial buildings, to Grand Hotel on Mackinac Island, she left her mark on Michigan. In Hampton Roads, Virginia, Kathleen’s prolific 20 years of design work can be viewed wherever you go. Municipal buildings, shopping centers, highway plantings, schools, office buildings, banks, retail stores, subdivisions, residential master planning and many other projects bear the mark of her excellent design. If you’ve been to Hampton Roads, you’ve seen her work! Select below for sample lists of projects by Kathleen. Planting plans and references for the projects listed will gladly be provided upon request. She and her team of experienced design professionals can handle your next project with skill and style.